46 Shorts young folks came along and we went with them. I enjoyed myself very well indeed. A gentleman by the name of Clay got my neck-tie. Will Reed was there and I had quite a gossip with him. Cousin George and his wife were there having come to Delavan the night before. I felt terribly tired when I got home for it had made me so very tired going to school that day. 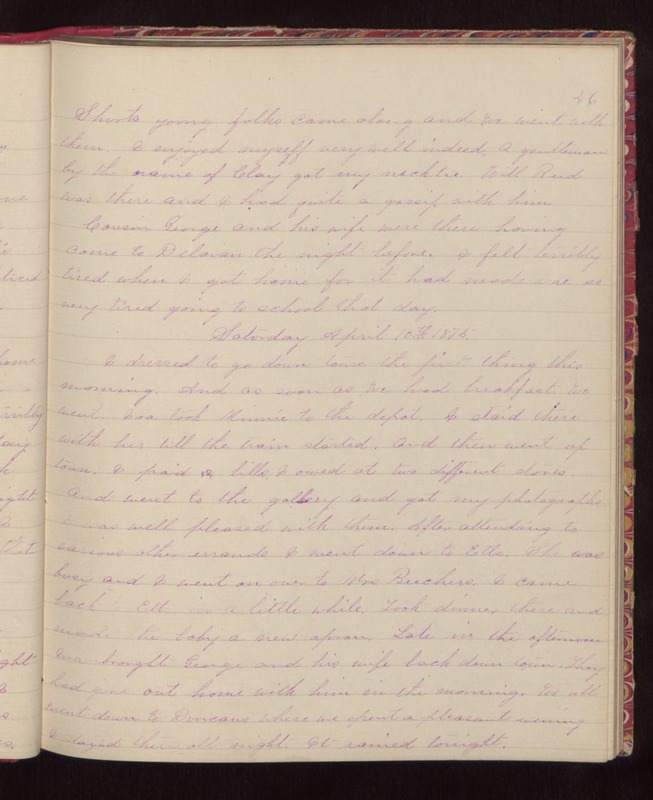 Saturday April 10th 1875. I dressed to go down town the first thing this morning. And as soon as we had breakfast we went. Ira took Minnie to the depot. I staid there with her till the train started. And then went up town. I paid bills I owed at two different stores. And went to the gallery and got my photographs. I was well pleased with them. After attending to various other errands I went down to Etts. She was busy and I went on over to Mrs Beechers. I came back to Etts in a little while. Took dinner there and made the baby a new apron. Late in the afternoon Ira brought George and his wife back down town. They had gone out home with him in the morning. We all went down to Duncans where we spent a pleasant evening. I stayed there all night. It rained tonight.